Brazil was discovered, almost by accident in 1500 by a Portuguese expedition live in the East under the command of Pedro Alvares Cabral. Cabral ‘s expedition followed the sea route to India traveled recently by Vasco da Gama, sailing around Africa. 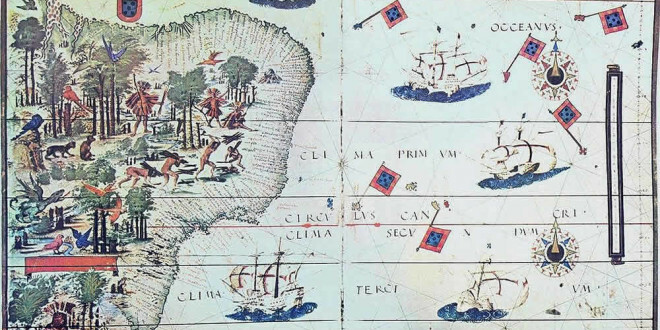 The expedition – to avoid the equatorial calms – followed a route far from the African coast that led to the discovery, on April 22, 1500, of the Brazilian coast. Cabral to these new lands gave the name of “Vera Cruz” . Following the discovery of Cabral, in the following years several Portuguese expeditions reached Brazil, but in the first 30 years – from 1500 until 1530 – the Portuguese were limited to quick landings and harvesting timber (the famous Pau Brasil). Only because of the French attempts to occupy the new land, Portugal decided to colonize Brazil. In 1532, the expedition Martim Afonso de Sousa founded the village of São Vicente, which became the first permanent settlement in Brazil. As of 1534 D. João III divided the territory into twelve hereditary captaincies, but this system of colonization proved to be unprofitable, so in 1549 the king decided to appoint a Governor-General to administer the entire colony. Junta provisória composed by Chanceler da Relação, Caetano de Brito de Figueiredo and other people. Junta provisória composed by chanceler da Relação, Manoel Antônio da Cunha Sottomayor and other people.